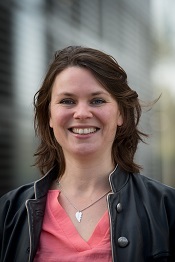 Saskia Ruijsink is working in the field of urban planning and urban development for more than 10 years. She is passionate about how cities develop and always curious to understand how people (professionals, non-professionals, from all kind of sectors) try to influence this process in formal and informal ways. She currently works at the Institute for Housing and Urban Development Studies, on training, advisory work and research in fields of participation, self-organisation and social innovation for urban planning and governance and sustainable urban development. She is a researcher in the EU funded TRANSIT project on Social Innovation (www.transitsocialinnovation.eu). In 2009-2010 she was based for four months in the Global Land Tool Network secretariat at UN-HABITAT in Nairobi, Kenya for an assignment on gender responsive land management and participatory enumeration. Kaat Peeters When opportunity knocks, build a door!